Toronto is a magnet for international retailers setting up their first North American locations and the Yorkdale Shopping Centre has become the destination of choice for many of them. According to CBRE’s 2018 How Global Is The Business of Retail? Report, Toronto attracted 40 new international retailers in 2017, the most on record for the city and more than double New York City’s 15. For the second consecutive year, Toronto attracted the largest number of new international retailers of any North American city. The report said Yorkdale Shopping Centre was the destination of 14 of the 40 new retailers in 2017, 86 per cent of which chose the mall as their first Canadian home. “An increasing number of international luxury brands are looking at Yorkdale as the top destination for entering the Canadian market thanks to its reputation as one of Canada’s premier shopping malls. Some of these brands include IWC Schaffhausen, Officine Panerai, Vacheron Constantin, Van Cleef & Arpels and Breitling,” said the CBRE report. Arlin Markowitz, with the Urban Retail Team at CBRE Toronto, said many global retailers are looking at Toronto as their first stop in Canada partially due to the city’s vast and growing Asian population. “Also when you look at Toronto’s high street rental rates, they are not exactly in line with our population,” he said. Markowitz said he often compares with Chicago to Toronto. Michigan Avenue in Chicago has rents of over $700 US per square foot and the Greater Chicago Area population is about five or six million. Toronto’s Bloor Street West has rents in the $300 Cdn per square foot range, yet the GTA population, at approximately 6.5 million, is the third-largest in North America. “So I think on a global scale, some luxury retailers specifically are looking at Bloor Street and Yorkville Avenue as interesting places to locate for both the Chinese consumer and the rental rates,” said Markowitz. CBRE said Toronto is the only North American market to make the list of top-20 target markets for new entrants, moving up two places from 2016 to seventh. Overall, Canada added a record 50 new international retail entrants last year. 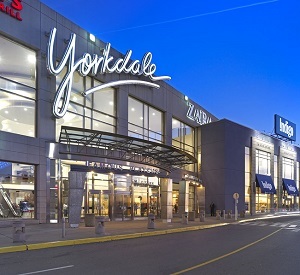 Markowitz said Yorkdale Shopping Centre, co-owned by Oxford Properties and Alberta Investment Management Corporation (AIMCo) and managed by Oxford Properties Group, has truly become a world-class centre. “They’ve been able to give retailers something that’s often hard to achieve on the street, in that they’ve had so many expansions over the past five years. I think there’s been three major expansions,” he said. Claire Santamaria, Yorkdale’s general manager, said the shopping centre pursues brands it believes would be a good fit, including brands actively looking to expand into Canada. “There’s a significant amount of research and foresight that goes into these conversations and we rely heavily on the success of the brands that have opened here in previous years,” she said. “We take an immense pride in working as good partners with each of the brands that we launch within our marketplace, knowing that they are usually on an expansion plan in Toronto or into the rest of Canada. Santamaria said the shopping centre’s first foray into luxury was with Tiffany & Co. in 2009. That opened the door to other luxury brands. “The evolution of aspirational and luxury and international brands into the Yorkdale mix really came gradually,” she said. Yorkdale, which opened in 1964, is about two million square feet with 270 retailers. Of the retailers that made their first foray into Toronto last year, luxury led the pack. The sector accounted for more than a third of new entrants (14), the majority of which hail from Europe, including Rolex, APM Monaco and Zadig & Voltaire, said CBRE. The restaurants and coffee category followed with 17 per cent of new entrants (seven), and mid-range fashion and eyewear with seven per cent each (three each). More than a third of the new international retailers in the city come from the U.S. (15), including the Cheesecake Factory, SoulCycle and Restoration Hardware. “Not only is Toronto a North American testing ground for brands, its affluent consumer base has an appetite for luxury products. Luxury brands are finding success in the city thanks to the strong economy, low unemployment, discounted loonie and record-breaking tourism – over 43.7 million visitors in 2017,” said Markowitz. “Retail accounts for 77 per cent of overall Chinese tourist spending in Toronto, with luxury goods contributing a high percentage. The cumulative effect of these factors on retail sales is not lost on these brands. Markowitz said he does not foresee any changes to the trend of international retailers landing in Toronto.